On a Clear Day You Can See Forever. This is the first movie on my list that I've gone into with a completely clean slate, with no previous knowledge. That alone won it some points up front. It's nice when a movie can still surprise me. 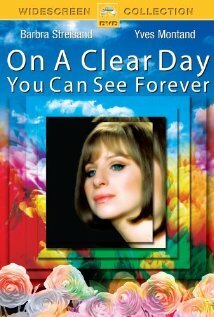 I added this movie as a little challenge to myself to see if I could overcome my perception of Barbra Streisand and give the movie a fair shot. A lifetime as a straight American dude doesn't really put me into her main demographic of fans. I'm just saying. Then there's the parent factor. You know how there are certain things that your parents love which you also end up embracing? In my case, a few of these things would be The Beatles (mom & dad), submarine movies (dad), and halvah (mom). But then there are those other things that your parents love which you end up rejecting with special fervor, for no real reason other than the fact that your parents love them. My parents may read this, so I'm going to decline to list any of those here. Well, except for Barbra Streisand. I know that for women of a certain generation, especially those (like my mom) who are products of Jewish heritage, Babs looms large, but for me? Meh... I really tried to be fair, though. The premise of On a Clear Day is actually a pretty interesting and unique one. A young lady (Streisand) goes to see a hypnotist(Yves Montand) in the hope that he can help her quit smoking, a habit her fiance disapproves of. When she displays clairvoyant abilities, he is much more interested in that. He agrees to hypnotize her, she believes to help her quit smoking, but his real purpose is to figure out how she came by her gift. What he discovers instead is that she has lived many previous lives, one of which he holds long conversations with and eventually falls in love with. Two interesting casting notes - Bob Newhart and Jack Nicholson both have small but key roles, early enough in their careers that they were not yet "Bob Newhart" and "Jack Nicholson." I'm not entirely sure whether I liked this movie or not. On one hand, like I said, the story really is a pretty interesting one. On the other hand, Barbra Streisand... Sigh. As I said, I really did try to be fair, but she really was not cast well in this part. As the modern day neurotic college girl, sure, but in the prior life scenes, where she's playing somebody English, it's just painful. She really takes you out of the story. RATING - I'm sorry, try as I might, Babs just did me in. I've got to give this one two daisies out of five. LESSON - Phew, this one's kind of hard, because it was a pretty trippy movie. Um... Dig deeper to find the person beneath the strange outer shell? True love is a matter of destiny and fate, and will catch you eventually? I dunno, I'm going to bed. For my purposes, I decided that "classic" could mean "anything older than me." If the classic rock station is starting to play stuff from when I was in junior high school, a movie made in 1970 is fair game. As far as the actual romantic content, I do agree that this isn't really a romance in the most traditional sense. I really knew literally nothing about this movie before I watched it, though, other than its cast and that Netflix had it under Classic Romances. Is "The Way We Were" on your list? If not, think about it. Young Robert Redford -- good for Courtney! From the Netflix copy: "Director Vincente Minnelli's fantastical musical.." Done! Musicals equal torture.